There’s the heavily-advertised King Tut in New York, and another King Tut, in Denver; Cleopatra in Philadelphia (NY Times review, here), The Mummy Chamber in Brooklyn,* and Mummies of the World in L.A.—not to mention those other Egyptian-themed exhibits which I am certainly forgetting—and how cool would this underwater museum be?? 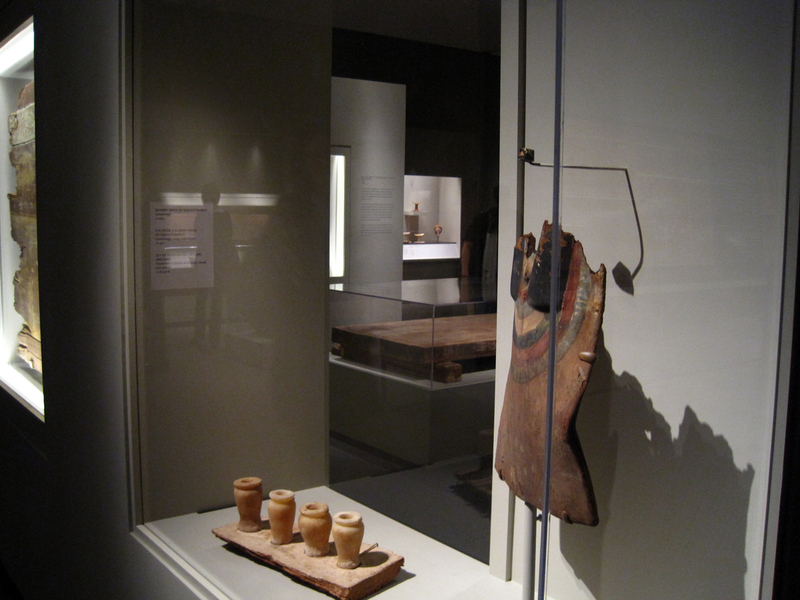 And then we have—had—The Secrets of Tomb 10A at the Museum of Fine Arts Boston. I’ve taken so long to post about this exhibition that it seems to have closed. Yesterday. Sorry. Truly sorry. I liked the exhibit very much. You should have seen for yourself that it was a perfect balance of anthropology and art, both, fascinating and beautiful. The story of Tomb 10A goes something like this: It was the tomb of the high officials Djehutynakhts (pronounced “je-hooty-knocked”), discovered in 1920 by a group of Harvard University-Boston Museum of Fine Arts archeologists. Inside was the largest funerary assemblage of a Middle Kingdom (2040–1640 BC) official ever found intact (despite the tomb’s having been robbed in antiquity): four coffins, walking sticks, pottery, canopic jars, wooden models of daily life, and—ew—a disembodied head. 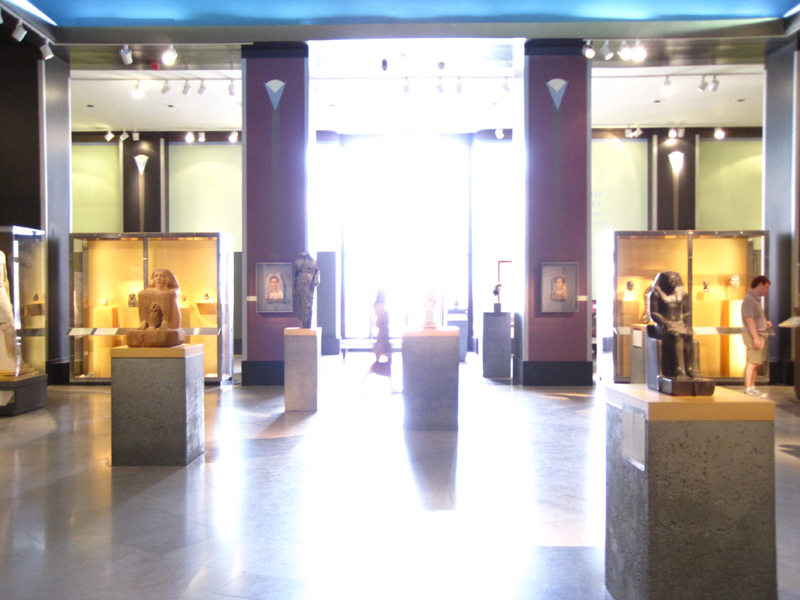 Egypt gave the entire collection to the MFA and sent it along to Boston. It met with some minor setbacks en route—not least, the collection’s catching fire—but arrive it did, only to be mostly tucked away in storage for ninety years. It was for the first time that the entire lot was on display. 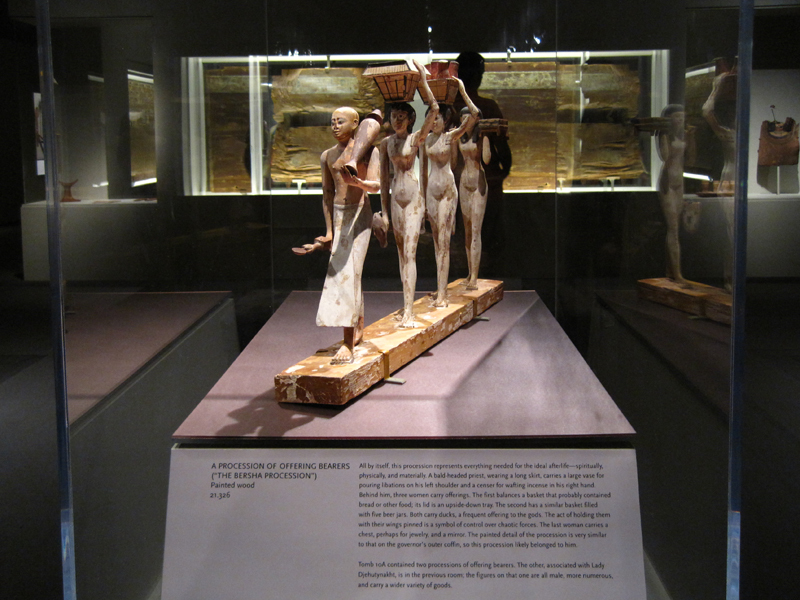 Walking into the exhibit, you first saw a statue, representative of Egypt during the Middle Kingdom, stood in front of large, richly beautiful photographs of the area around the tomb. This first room set the stage: information about Egypt during Djehutynakht’s time, introductions to the “cast of characters,” and a description of how the exhibit was organized. It told you that in the next room you’d see objects from the actual tomb, in the third room you’d see what was missing from the tomb, and in the final room you’d learn about the archeological investigations still underway on the site. I appreciated this road map of what was to come in the relatively large exhibit. It helped to keep clear in my mind where I was within its organization. But, a question for you non-museum-design/development-types: is information like this important to you? Do you find it helpful or even notice it? The second room, below, was by far my favorite part of the exhibit. 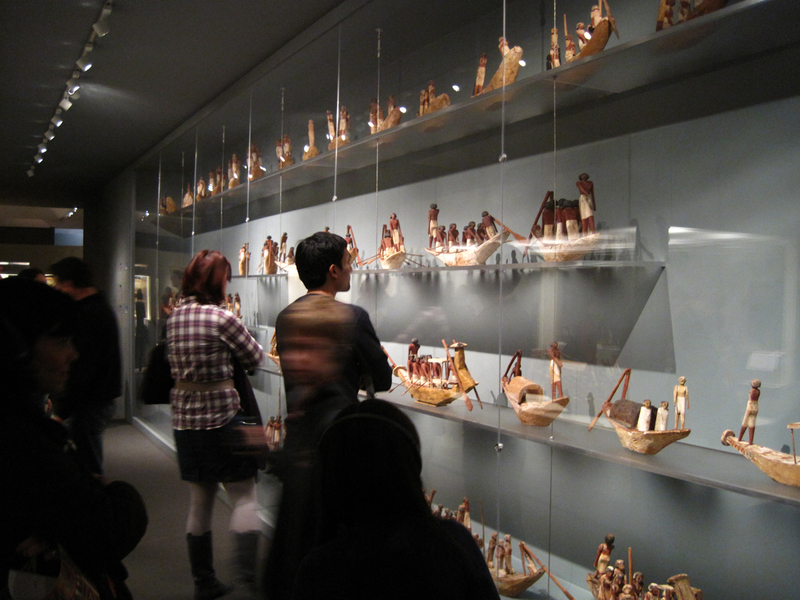 The wooden models were all gorgeous, and I love the simplicity of the wall of boats. 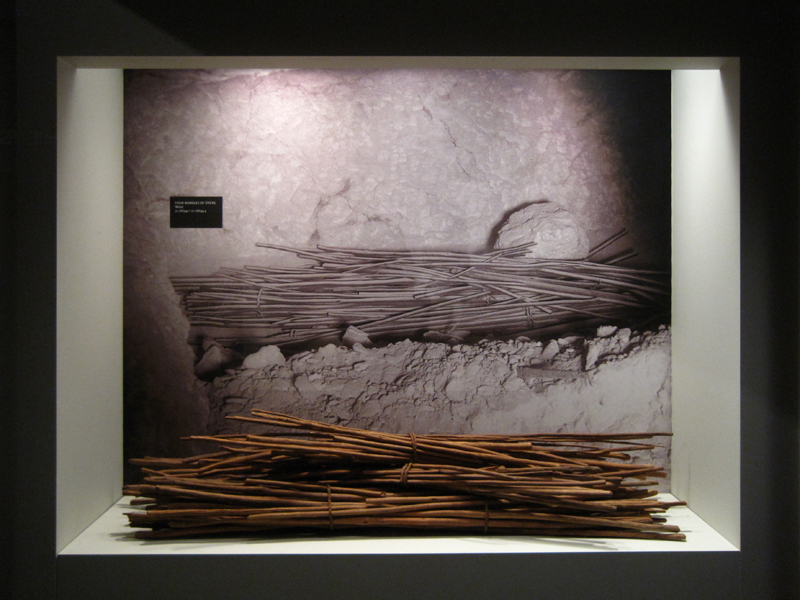 The artifact displays throughout were sparse and reverential, arranged simply and tastefully. Absolutely lovely. * I’ve seen The Mummy Chamber too. While Tomb 10A was dark and atmospheric, Mummy Chamber is bright, bright, bright—especially on a sunny summer afternoon. It too had some nicely currated artifact cases, though I prefer the moodiness and intimacy of the MFA show. 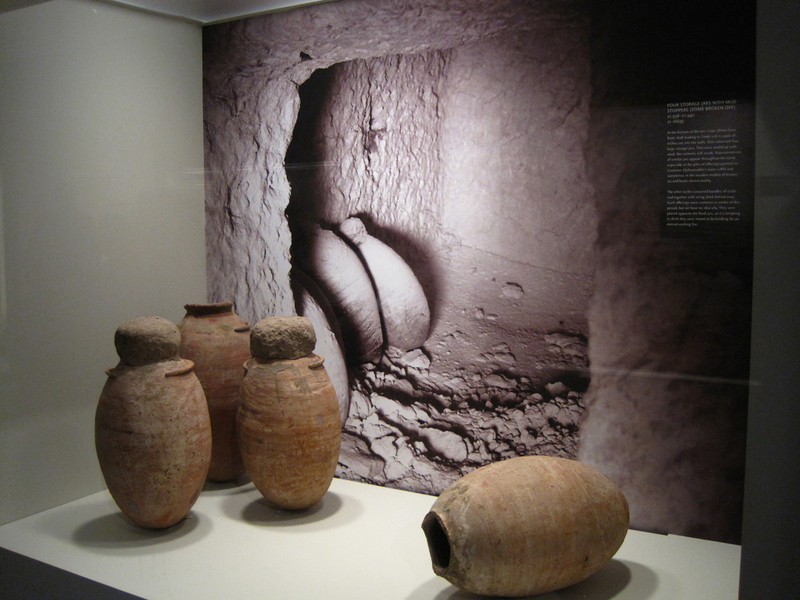 But what does the Mummy Chamber have going for it, most important of all, that Tomb 10A doesn’t? Long-term open-ness. 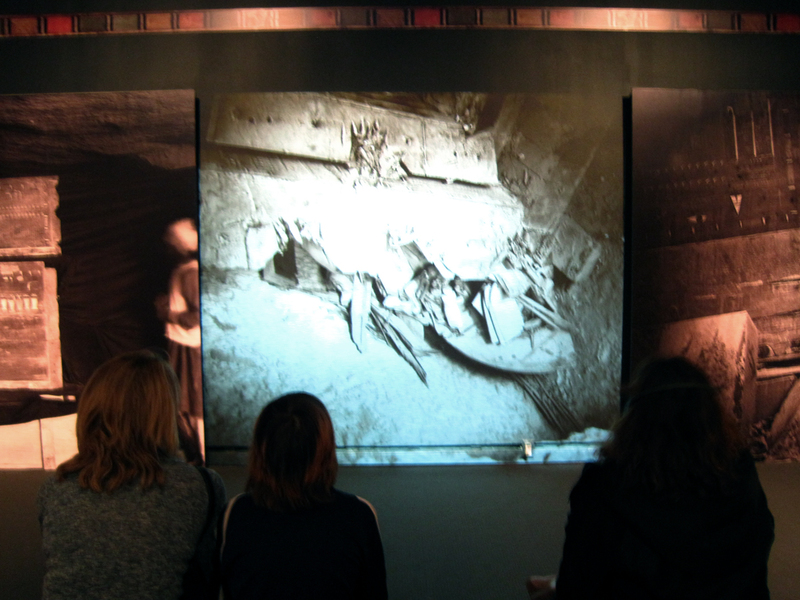 I was just forwarded your blog regarding the Secrets of Tomb 10A exhibition. I am glad to see such a thoughtful review. It is rare to read a critique that distinguishes the design of the show. Though exhibition graphic design can be quite stealth if done well, we decided to allow the graphics in this exhibition to assert itself as part of the architecture to provide a tone and structure of discovery. We developed a very complex problem to solve – to weave three temporal stories throughout the rooms and form a whole narrative quite unique to the MFA. They are; the story of Egypt’s Middle Kingdom and the funerary objects of a particular tomb, the discovery of those objects by the MFA/Harvard Expedition team in 1914, and the conservation, care, and display of those objects, as well as the ongoing archaeology of the site, in the present. So we had 2000 BC, 1914, and 2010 to somehow reveal and integrate with the objects. We also had a point of view as an art museum to show the beauty and rarity of the objects – in particular the quality of the painting on the outer coffin panel and the masterpiece of sculpture in the Procession of the Offering Bearers. And we had a mandate from the director to give the viewer the sense of moving through the tomb with a flashlight as the archaeologists did. I had the opportunity as the exhibition graphic designer to explore the MFA photography archives and scan glass plate negatives, many of which had been in storage since the expedition. 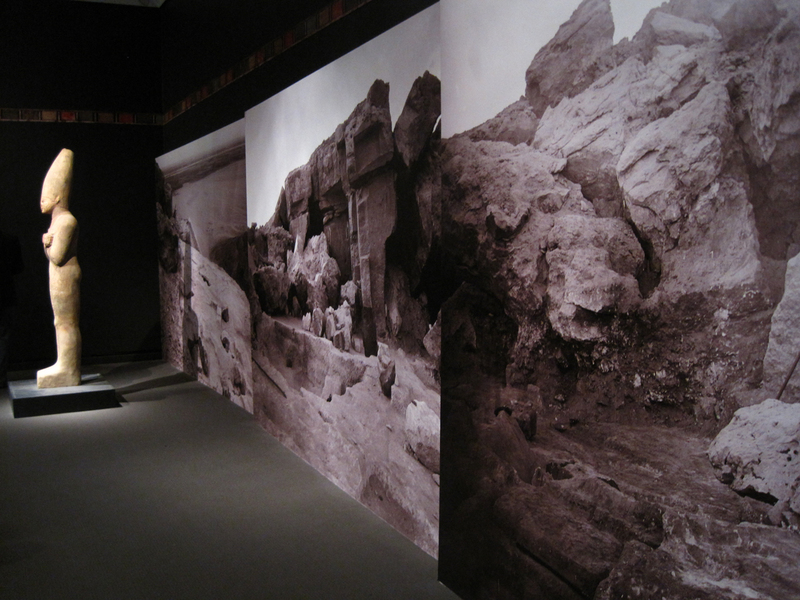 So an archaeology of photography took place, and the nature of those images when blown up resurrected the Egyptian landscape of time and place that both provided context for the objects and replicated the mysterious pull this place had on people in the early part of the 20th century. I worked with an architectural model of the gallery all last summer to create those panels that sat on the floor, on shelves, projected as moving light, and always existed in layers to echo the many layers of the shifting story. I have just finished work on the Pre Dynastic and Old Kingdom permanent galleries at the Museum and will be installing many of the objects form Tomb 10A in the new Middle Kingdom gallery for the opening of the New Wing in November. It’s interesting to see the very different job an exhibition graphic designer has to do when providing context and narrative for permanent galleries to last for an unlimited time and to cohere to the greater architecture around it. I hope you keep looking…. Jennifer, thank you for this thoughtful description of your design process. How thrilling it must have been to explore the museum’s photo archives; “excavating,” if you will, photographs that had never before been on display. And how lucky of you, to have worked with primary resources as beautiful as glass plate negatives. Congratulations on an excellent exhibition. I look forward to November’s opening!